So honored to have work included in the New Impressions 2019 exhibition produced by the Hamilton Wood Type & Printing Museum of Two Rivers, Wisconsin. 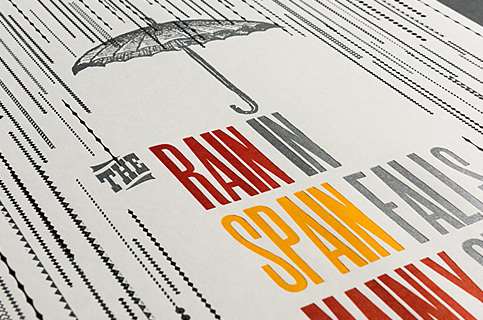 The letterpress print selected to be included in the exhibition, “The Rain in Spain Falls Mainly on the Plain,” was produced in 2018. New Impressions is an international, juried exhibition to showcase exploration and creativity with letterpress printing techniques. From this age-old tradition, the exhibition strives to challenge and inspire artists to continue the love of printing. 2019 is the fifth year of the New Impressions exhibition. The exhibition will be on display from April 17 through June 30, 2019 at Hamilton, and will travel beginning Fall 2019.